Posted on Tue, Jan 15, 2013 : 5:59 a.m.
A longstanding debate about whether downtown Ann Arbor needs a new hotel and conference center re-emerged Monday night during a special City Council work session. The topic came up when representatives from the Downtown Development Authority presented a new plan for encouraging private redevelopment of five city-owned properties downtown. 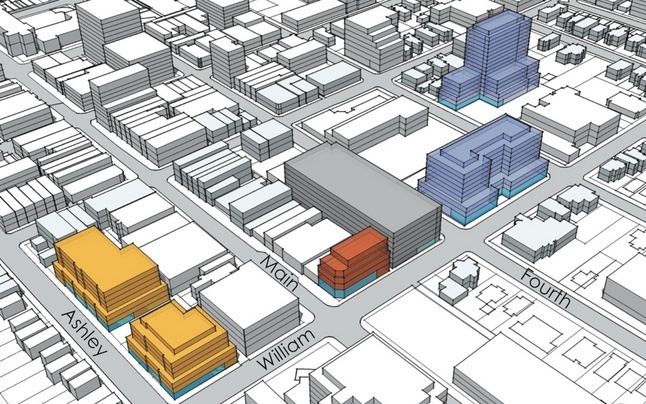 The final version of the DDA's so-called Connecting William Street plan was revised from a draft released last month. It now recommends packaging and marketing two properties together — the Y Lot and the Library Lot — with a focus on "lodging or office" for those sites. DDA Executive Director Susan Pollay introduced Todd Poole, a land-use economist from 4ward Planning LLC, the consulting firm that helped craft the plan. Based on his firm's analysis, Poole said, it looks as though Ann Arbor might be underserved in terms of hotel rooms and conference center space relative to other Midwestern cities. "We took a kind of deep-dive look at the inventory that you have in the area," he said. "I'll tell you that you have a number of hotel facilitates that are — I won't call them substandard, but they're old, and they're not the facilities that are going to attract what is not now coming to your downtown." Poole said he's had conversations with university professionals and industry planners — people who book large events — and there are a number of "society-type meetings" that can't come to Ann Arbor right now simply because the city doesn't have the appropriate size facilities. "You don't have the scale of facilities necessary to accommodate really large conferences that would come to your downtown and spend money and that sort of thing," he said. Pollay cited a recent Ann Arbor Area Convention and Visitors Bureau report that indicated Washtenaw County is enjoying its highest hotel occupancy rate in 25 years. In fact, Pollay said, the occupancy rate in Washtenaw County is the highest in the Midwest, including Chicago. Based on those findings, the DDA suggests in its report that downtown tourism could increase and additional downtown lodging could be supported. Mayor John Hieftje said he thought the city already settled the debate when it rejected a private developer's proposal for a downtown hotel and conference center in April 2011. "There was a lot of work done in the community, and I came to the conclusion — and I think other council members, too — that just wouldn't work here," he said. Hieftje said a conference center might draw activity 60-70 days of the year, but in order to make it viable there really needs to be 300 days a year of activity. "So I don't think that's going to be a path that we go down," he said, adding the University of Michigan would have to commit to make a downtown conference center work, and he doesn't see that happening since the university already has enough meeting space of its own. "They have a very big space up at the North Campus Research Complex that they took over from Pfizer, a room that will hold hundreds and hundreds of people," he said. Poole said he's talked to U-M about that. "I'm not recommending that you build it," he said of a conference center. "What I'm recommending, though, is that you do a really strong due-diligence study to settle the issue once and for all." Hieftje said as soon as it became apparent nearly two years ago that the city wasn't going to participate in financing a conference center on the Library Lot, the proposal from New York-based Valiant Partners quickly evaporated, which suggests its viability depended on a city subsidy. 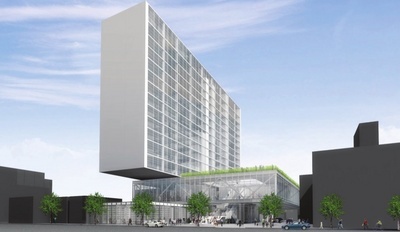 This proposal for a downtown hotel and conference center by New York-based Valiant Partners was rejected by the Ann Arbor City Council in April 2011. Council Member Margie Teall, D-4th Ward, said she was in favor of the conference center proposal two years ago and she still thinks it could be "a very exciting development downtown." She wondered if there's a way it could happen without the city being on the hook financially. Poole said the city shouldn't put out anything more than a "token incentive" such as helping finance project elements that provide public benefits. "If there is no developer standing in line to do it, then certainly the city shouldn't be trying to incentivize that to happen in a forceful manner," he said. Hieftje said he already decided a long time ago that a conference center wasn't going to work, and he wondered where Poole's remarks were coming from. Poole said his firm performed a "cursory lodging analysis," though he said they're "not specialists in lodging." He said there are "demand drivers" and "anecdotal support" coming from people interviewed, such as CEOs of corporations and representatives of educational institutions. "Ann Arbor is probably underrepresented when it comes to having not just lodging facilities," he said, "but lodging facilities that also have conference space to go with them — again, based on both the corporate presence that you have, as well as the size of your university." Council Member Sumi Kailasapathy, D-1st Ward, expressed concerns that if a new hotel was built downtown, other hotels could see a drop in business. Poole said it's not unreasonable to speculate that "maybe one would go under," but he said that's the natural course of events in all businesses. Council Member Stephen Kunselman, D-3rd Ward, pointed out one of the city's past consultants, the Detroit-based Roxbury Group, said the same thing in 2010 that's being said now — that a hotel and conference center could fill an unmet need in the downtown market. Mon, Jan 21, 2013 : 9:18 p.m. This in the same issue as an article stating downtown Ann Arbor is unlikely to change much. Please, we all have eyes and can see how downtown, campus and other areas of town are changing to the point where it simply isn't the same picturesque town it used to be. Wed, Jan 16, 2013 : 6:45 p.m. This city needs another hotel downtown. Grand rapids has many and is not that much bigger than we are. It is a shame all we have is Campus Inn. Bring another hotel downtown and it will be used much more than the mayor says and thinks. Wed, Jan 16, 2013 : 11:36 a.m.
&quot;Actually, the DDA was behind that old effort too, and much of the business was conducted in secret, until the City Council issued an RFP. The Lodging Report produced by Poole basically repeated all the things said in the Roxbury report. Here is a succinct summary: &quot;We talked to the people who matter and they told us this was a good idea.&quot; BTW, that report that Pollay is citing from the CVB is not available as a public document.&quot; THIS has been the issue all along. Secret meetings and dealings, a lack of openness and transparency and going through the motions of accepting public input and then ignoring it. The DDA needs to be abolished, the duties and projects rolled up into the City management structure and the taxes skimmed off the top for new buildings should return to the city treasury. I think this should be a top priority of City Council (abolishing the DDA) for 2013. Wed, Jan 16, 2013 : 4:04 a.m. If there's no public need for the land then sell it back to the private sector and collect much needed taxes. Wed, Jan 16, 2013 : 12:57 p.m.
People seem to think they need the parking. Also people want an open park/plaza. Parking provides revenue for the city and parks provide rest and recreation amidst city activity. Wed, Jan 16, 2013 : 3:06 a.m. I dont understand exactly what is being proposed. Before the City of Ann Arbor, or a city group, (DDA) thinks about getting into the land development business and financing any project, they should look at Ypsilanti to see how successful cities are when they get into things they don't understand. Tue, Jan 15, 2013 : 8:47 p.m.
Tue, Jan 15, 2013 : 8:46 p.m. Guess you'd better add me to another one of the &quot;whiners.&quot; As Mayor John Hieftje stated, he thought that this matter had been settled. So did we--foolish us. Just like the Library expansion project, so roundly defeated--yet there continue to be noises to bring it back again. What ever happened to the will if the people?! Studies that had been done previously re: convention centers indicated that they usually wind up costing the municipalities and become a burden to the taxpayer. Thanks but no thanks. We are frequent users of the Kline lot on weekend evenings and though it is true that it often is full, there is frequent turnover and a little patience has always resulted in obtaining a space. This past weekend, the full sign was lit, yet, as we drove around there were 4 or more empty (non-handicap) spaces available. We reported this to the cashier. In any event, it would seem that the DDA is interested in proposing/pushing their own vested interests and the public be damned. Not a way to run a city! Please stick to your guns, Mayor Hieftje. Wed, Jan 16, 2013 : 12:16 p.m.
Tue, Jan 15, 2013 : 8:25 p.m. This video http://vimeo.com/6821934 is long (an hour) but is a classic study of public spaces. There is a lot to think about here in relation to the type of street activity we want in Ann Arbor - &quot;vibrant&quot; I think we call it. It occurs because of well-planned public spaces. The DDA is supposed to be helping make this a vibrant downtown but does not engage in this type of planning. With regard to a hotel/conference center: those who would would like to revisit the history can find it all on this page: http://localannarbor.wordpress.com/library-lot-conference-center/ I predicted that this idea would resurface in my campaign blog last summer. http://viviennearmentrout.com/2012/07/19/about-that-conference-center-on-the-library-lot/ Actually, the DDA was behind that old effort too, and much of the business was conducted in secret, until the City Council issued an RFP. The Lodging Report produced by Poole basically repeated all the things said in the Roxbury report. Here is a succinct summary: &quot;We talked to the people who matter and they told us this was a good idea.&quot; BTW, that report that Pollay is citing from the CVB is not available as a public document. Thu, Jan 17, 2013 : 2:52 p.m.
Vivienne, your excellent pieces on local politics always add a lot to the limited information provided on topics like this by the standard AA.com piece. Do you know anything more about the DDA dissolution topic, what communities have tried it, who might favor it here, etc.? The feeling that they have lost touch with the community, and maybe reality in general seems to be strong. Tue, Jan 15, 2013 : 7:57 p.m.
Tue, Jan 15, 2013 : 7:12 p.m.
2 Words Water Park Make it happen. Wed, Jan 16, 2013 : 2:46 p.m.
Tue, Jan 15, 2013 : 6:51 p.m. I very much like and support David Cahill's remarks about the quote from Michigan law which instructs how to dissolve an entity that has fulfilled its mission: the DDA. Please scroll down and read David's remarks. Tue, Jan 15, 2013 : 6:58 p.m. Thanks for the kind words, Barbara! Tue, Jan 15, 2013 : 6:07 p.m. I can see the marketing now &quot;visit Ann Arbor, but leave your car at home&quot;. Yes City Hall, there is an abundance of parking in AA, so why not develop it? Another win for the braintrust bent on banning auto traffic from downtown. Tue, Jan 15, 2013 : 6:05 p.m. In 2010 here's what the poll came up with: Are you happy with the decision to pursue a hotel project for the Library Lot? Yes, I think a hotel and/or conference center is the right choice. 37% No, I wanted one of the other proposals, such as a public park, to move forward. 51% I didn't like any of the proposals. 9% I don't care. 1% So why are we even talking about this again? Wed, Jan 16, 2013 : 6:05 a.m.
Because that was a website poll and essentially meaningless to gauge actual public opinion. Tue, Jan 15, 2013 : 5:56 p.m. The Ann Arbor Inn was a giant flop. The business was just not there except for 6 football weekends. The owners who were out of state used it as a tax write off. A White. Elephant from day 1. Tue, Jan 15, 2013 : 5:55 p.m.
Go to Lansing and do your due diligence on their &quot;conference center&quot; attached to a hotel. Report back. Tue, Jan 15, 2013 : 5:17 p.m. This seems like a great article for a poll. And also the other DDA-related article about selling off the parking lots. Tue, Jan 15, 2013 : 5:15 p.m.
A solution/compromise could be a two tiered park. Assuming this is possible and cost effective, you could have the ground level park and adjoining it another park built over the library road/driveway. That way both the hotel/conference people and the park people can get what they want. The city can use some of the money from the sale of the lots to build the second story park. I think it could be very interesting and unique. Wed, Jan 16, 2013 : 4:38 a.m.
Could we please have blue lights on the waterfall? Tue, Jan 15, 2013 : 9:19 p.m.
A waterfall from the upper park to the lower park would be esthetically pleasing and functional (kids can play in it). I think it has a lot of potential. It doubles the size of the park without taking up anymore land. Please give it a thought. Tue, Jan 15, 2013 : 4:54 p.m. I travel all the time, I see hotels routinely. Ann Arbor has hotels the meet or exceed the standards in most communities 5 to 10 times its size. There are reasonable conference facilities in the community, Washtenaw Community College supports very large conferences in the summer. Most weekends some of that space is available. There are at least 4 hotels in Ann Arbor that can support a 1,000 person conference (not all of them can sleep there - but there is room for the conference). EMU tried a conference hotel - a really nice one - and it went bankrupt for lack of use. Most city owned and run conference centers - or subsidized ones - run at a loss. The business of getting conferences is very competative today. The cost to fly to Detroit is high compared to Columbus, Ohio or even Toledo, so getting over that barrier is hard for conference organizers who want attendence. Meals are great in Ann Arbor - the food is very good - but the average price of a meal downtown is easily 20 to 50% higher than similar communities with lower airfare - another major negative to a conference organizer. To be profitable meeting space needs to be booked at least 50 percent of the time, I doubt a downtown hotel could do that. Weddings with remote parking and pay to park - not likely in a downtown hotel - there are better easier places to do it. Wed, Jan 16, 2013 : 3:42 a.m.
timjbd - Try this - try to book out of Flint, Toledo and Detroit and see what the differences are. The US Department of Transportation did a study a year ago on Market power and because of the concentration of Delta flights in Detroit it came out in the top 10 for concentration and higher costs. Tue, Jan 15, 2013 : 5:44 p.m. I fly a lot. I have not found flights into/out of Detroit to be high comparatively. Where are you getting your info? As for conference centers, they are money losers. They are HUGE and cost a lot to heat and cool- even when not in use. Which is most of the time. Tue, Jan 15, 2013 : 4:35 p.m.
Conference centers are dinosaurs. My company's attendance at business conferences is a third what it was just a few years ago, because conferences are not as useful as they used to be. And, saying &quot;hotel occupancy has reached new highs&quot; is just spin. What is the &quot;high&quot;? Somebody said 60-something percent. That doesn't make an additional hotel sound like good business. Let the city-edge hotels refurbish themselves into destination for &quot;discerning&quot; visitors and get some decent transit going from them to downtown. Tue, Jan 15, 2013 : 4:19 p.m. The downtown area is largely a collection of restaurants and specialty shops. The DDA is a collection of people with direct interest in these shops. A hotel/conference center will provide a new supply of patron for downtown businesses. Given this, the members of the DDA should form a consortium, purchase these properties and develop them as they see fit. If they opt out, the city should sell the properties to the highest bidder and let the market determine the future. Tue, Jan 15, 2013 : 6 p.m.
Why sell them at all? They're money in the bank, and a great place to park. Do you think downtown real estate prices are going up or down? Tue, Jan 15, 2013 : 4:31 p.m.
Why? Why must the market determine the future of these spaces? Why must every last lot be a money-maker for somebody? Why can't the people of the town decide how to use these few last open spaces? Why not leave well-enough alone? Does everything have to change?? Could we have a referendum on how to proceed, or not, here? Tue, Jan 15, 2013 : 3:56 p.m.
not only should this project go forward but we should build the biggest hotel in America to match the football stadium. Maybe we can throw in a subway between the two. We can fund the whole shebang by placing a surcharge on the choo choo train commuters pouring down 23 from Hamburg and Whitmore lake. What could possibly go wrong? Tue, Jan 15, 2013 : 7:58 p.m.
You mean Tim Hortons? Why do we get upset about China products when Canada is comin on in! Tue, Jan 15, 2013 : 3:52 p.m.
Why aren't they looking at building living space for the 50+ year olds who want to come or live downtown? Maybe if the hotel conference center goes bankrupt it con be converted to that like in my former hometown. Actually, it was converted to a senior care center. Tue, Jan 15, 2013 : 8 p.m. The campus inn could never be filled, hence the retirement living. No to a hotel/conference center. Tue, Jan 15, 2013 : 3:18 p.m. I think most of us, the good citizens of Ann Arbor, do not want to see this trend of developing every square inch of downtown continue, or heaven forbid, escalate. Personally, I think the Palio lot and the Klines lot are important parts of the charm of downtown, open, friendly spots to pull in and do some shopping. They are busy, well-populated, safe places to park, welcome anomalies in the trend toward huge looming structures. If you are not a woman who has parked in one of the parking structures downtown at night, you do not understand the dread some of us have of these places. Parking lots are not the best use of our open space downtown, granted, but for many of us, they are better than more monstrous, unnecessary buildings in our fair city. Tue, Jan 15, 2013 : 4:13 p.m.
Tue, Jan 15, 2013 : 4:12 p.m. Totally agree. Especially after what happened in the Librrty Square structure. Tue, Jan 15, 2013 : 2:57 p.m. I wonder what the University would say their visitors/guests feel about their experience coming to Ann Arbor. We are, as several have noted, a small town built around a university and it seems reasonable that most visitors coming to A2 do so to visit the U. Fine, then ask them what they think of the available accommodations. How does visiting A2 stack up against other university towns they visit? Occupancy rates are interesting, but not conclusive: you might be able to sell everything you make and still not satisfy your customers. Tue, Jan 15, 2013 : 2:45 p.m.
@Twanders: You say &quot;There isn't even a b&amp;b or an inn that close to Main Street.&quot; I can think of 2 within short walks, the Burnt Toast Inns on William and Washington. A simple search will likely turn up more. Wed, Jan 16, 2013 : 4:42 a.m. So when Ann Arbor lands the 2016 North American International Auto Show for its new convention center, where are the attendees going to park? Oops, I forgot about Wally, the monorail, and Southeast Michigan Regional Transportation Authority. Tue, Jan 15, 2013 : 7:45 p.m.
That's right. You don't expect people who attend an Auto Show to drive. &quot;Poole said it's not unreasonable to speculate that &quot;maybe one would go under,&quot; but he said that's the natural course of events in all businesses.&quot; Oh, why yes. Let taxpayers subsidize a new facility and then be stuck with cleaning up a failed bankrupt hotel downtown. Then, after that is torn down, we can finance another new facility. Disband the DDA. Tue, Jan 15, 2013 : 2:26 p.m. I would love to see a higher end hotel in downtown Ann Arbor, such as a Westin, St. Regis, or JW Marriott. There is not ONE single place to stay in the actual downtown area. Campus has the Dahlmann and the bell tower hotels but those aren't that close to Main Street. There isn't even a b&amp;b or an inn that close to Main Street. This is something that has been missing for a LONG time and would be a great addition to the city. Lansing has the Kellogg center, I think it's time Ann Arbor had a conference center and hotel that is upscale (no offense but most of the hotels in A2 just are not what a discerning well travelled individual wants or expects). I'm all for it and the sooner the better! One tricky piece is how will the parking situation work, they will need to make sure to really look into this key piece. Tue, Jan 15, 2013 : 8:30 p.m. The Kellogg Center is in East Lansing, not Lansing. It is on the MSU campus and is an adjunct to the university's Hotel and Restaurant program. It is funded by the Kellogg Foundation and is not at all comparable to a commercial hotel and conference center. Tue, Jan 15, 2013 : 8:13 p.m. There are several B&amp;Bs downtown. Just do a quick web search. Tue, Jan 15, 2013 : 4:38 p.m.
Twanders there is a reason no 5-star hotel has been built recently in the downtown area- There is not enough business to support that type of hotel. Ann Arbor is a laid back college town it dosn't fit the demograhic profiles hotels like that need to survive. Tue, Jan 15, 2013 : 3:36 p.m. Most would agree that it is so lovely to be pampered. And there is, quite frankly, no place for wealthy clientele to spend. Yet what five star attraction actually now exists downtown demanding such a massive five star hotel and conference center to be erected nearby?? The well-heeled here already have a place to stay and ability to entertain their special visitors. Beyond self-supporting B&amp;B estates complete with security, there is zero need to accommodate others. They have no business which benefits Ann Arbor. Tue, Jan 15, 2013 : 2:21 p.m. Wed, Jan 16, 2013 : 4:36 a.m.
Is it as simple as getting a council member to bring a resolution for dissolution of the DDA to the table at a council meeting and asking for a vote on the resolution? Mr. Cahill, do you know any council members who might consider doing this? Tue, Jan 15, 2013 : 7:54 p.m.
David, how many votes does it take for Council to abolish? A simple majority? Tue, Jan 15, 2013 : 3:13 p.m.
Well said ! However the &quot;shambling zombie&quot; in this case is the DDA. If the city doesn't have the buns to do the DDA dissolution then they should hire &quot;Alice&quot; as a consultant (Resident Evil franchise heroine played by Milla Jovovich). She knows exactly what to do with zombies. Tue, Jan 15, 2013 : 2:28 p.m.
Next time our downtown is in a state of decay, the mayor can appoint a new DDA to help with the situation. Tue, Jan 15, 2013 : 2:17 p.m.
Any proposal for a hotel and conference center that doesn't also significantly increase the amount of parking downtown should be a nonstarter. Our downtown is starved for parking even with the new money pit, and hotels and conferences require huge amounts of convenient parking. My company regularly books meeting space at a hotel near Briarwood, and we put hundreds of cars in the nearby lots during those events. Who's going to come to a downtown conference that offers no parking? I smell a bait-and-switch brewing here ... let's dig a huge hole in the ground with the promise that it will improve the parking situation downtown, then a few years later we'll commandeer most of that garage for the conference center we want to build on top of it, resulting in a net loss of parking for local residents. Don't let this happen. Tue, Jan 15, 2013 : 2:08 p.m.
Maybe this will finally convince some people that the library isn't trying to build a convention center, since the city is. Tue, Jan 15, 2013 : 3 p.m.
Tue, Jan 15, 2013 : 2:34 p.m.
Tue, Jan 15, 2013 : 2:07 p.m.
What is the deal with all the consultants? Ann Arbor must be the softest touch out there; this town is keeping the consulting industry in the black. I think it would be great if council would establish a moratorium on consultant spending. &quot;and they're not the facilities that are going to attract what is not now coming to your downtown.&quot; So yet more &quot;build it and they will come.&quot; We can never get enough of that. &quot;What I'm recommending, though, is that you do a really strong due-diligence study to settle the issue once and for all.&quot; Uh, didn't we DO this diligence in SPADES like twice already? We going to look at trolley cars again too? And what i this guy a specialist IN exactly, if he's doing this &quot;deep diving&quot; into what our inventory is (which I suspect is just looking at what occupies the buildings) , then advises us to a have another hotel, then backtracks and says he's not an expert? I'm flabbergasted that Hieftje didn't jump on this, but thank goodness. ENOUGH WITH THE CONSULTANTS! Tue, Jan 15, 2013 : 2:03 p.m. Wed, Jan 16, 2013 : 4:32 a.m. Right? But when I suggest that this is happening all the time in these committees I get angry replies. Of course these studies are going to suggest work that benefits the firm and the firms associates. This is how business is done in this town. Thanks for pointing it out again, maybe everyone else will catch on and start voting. These ideas need to be separated. I honestly don't know if we need a sizeable convention center in Ann Arbor. That needs to be studied, particularly as the city would inevitably be on the hook for some of the cost. But there is a desperate need for a good hotel! That has to move forward. Sat, Jan 19, 2013 : 3:23 p.m.
One thing I think a dedicated convention center would be useful for is taking the Art Fair OFF the streets. Driving in downtown Ann Arbor is already enough of a nightmare, we don't need major streets closed off to host something that should be inside. Incidentally, I've disliked the Art Fair for this exact reason since before I was old enough to drive. Tue, Jan 15, 2013 : 1:58 p.m.
No Ann Arbor Inn. No thank you! Tue, Jan 15, 2013 : 1:54 p.m.
Great. Anecdotal data from a company who doesn't specialize in lodging. Where do I send my check? Has even the mayor lost control of the DDA? Sure sounds like it. Tue, Jan 15, 2013 : 1:49 p.m. Yes! Tax, waste and spend. It is the Democratic way. Also the trend of AA city leadership. This again proves the age-old saying that you can't fight city hall. Time to leave this town. You have to face the facts, Goob that the Democrats and UM own this town. The voters are apathetic to anything they do. Either embrace it or leave. There are no other options. I do agree with you, even though I am a registered Democrat that a lot of what our city leaders have and are doing is just plain wrong. Tue, Jan 15, 2013 : 1:42 p.m.
Once again the DDA is going ahead without considering the public viewpoints. They are a bunch of yuppies who want to build their reputations on the backs of the taxpayers. We don't elect them and thus they don't listen to what Ann Arborites want for our town. Tue, Jan 15, 2013 : 1:36 p.m.
@ RYAN We have read the same news story several times about the DDA dream. Where is the not-DDA story ? Are there any alternative suggestions for that public land being forwarded ? The Bush administration (Fox et al) used a similar tactic. Familiar CIA disinformation approach. Flood the public brains with a constant information picture - no matter how attractive or repulsive. No matter how true or false. No matter how embarrassing or whatever else may be more important for people to know. It was always, always the same subject matter from the same White House &quot;press corps&quot; dominating the public thoughts. In the Bush case it was &quot;terrorism&quot;. In the Hieftje case it is &quot;development&quot;. How about the Public case? Tue, Jan 15, 2013 : 4:58 p.m. Thank you for the reply Mr. Stanton. Could you please be more specific? Here is the balance of investigative reporting that I found going back to October. Pro DDA articles (12) Today - (2) Jan 10th - DDA help finance 9th - Pollay on development Jan 5th - Release drawing Jan 2nd - DDA new survey Jan 1st - 5 things to watch, DDA Dec 19th - DDA seeks feedback Dec 5th - DDA draft release Nov 30th - DDA underground lot Nov 29th - DDA final stages Oct 3rd - DDA funding study Additional articles about a New Library vision Counter DDA articles (0, 3 opinions) Jan 13th - Opinion Very little connectivity Nov 27th - Opinion Parks and open space Oct 12th - Opinion Flawed DDA data Additional opinions about a failed Library vision Thanks again for all the reporting done. We've had a handful of stories and guest columns about the Library Green Conservancy's vision for a downtown park on the Library Lot site. If you know of another idea that hasn't gotten attention, let me know. Two articles today! Sis Boom Rah....DDA Yah!!! Tue, Jan 15, 2013 : 1:22 p.m.
Oh, and let's not forget that the University absolutely refuses to commit to any use of the proposed conference center. The DDA would love another hotel downtown, even though the market place has located all the new hotels by the expressways (surprise?) and the University Inn is now a senior center. Ask Dahlman what his occupancy is at Campus Inn for an apples-to-apples comparison. He's claiming closer to 50%, as I recall. Tue, Jan 15, 2013 : 4:07 p.m.
Dahlman's Campus Inn is a joke! Have you been there? No wonder his occupancy is so low. He probably never gets return customers. Oh, and BTW, Dahlman gave money to the campaigns of every Council member who is against a downtown hotel ... the Mayor too! Ryan, report on that please! Tue, Jan 15, 2013 : 1:18 p.m.
Tue, Jan 15, 2013 : 2:38 p.m.
Kai, if the mayor was totally against the DDA plan why did he invite them to give their presentation to City Council. Rep. Teall enthusiasm doesn't count. She is on her way out and likely posing for a new DDA job just like the former Rep. Lowenstein. Tue, Jan 15, 2013 : 1:13 p.m.
Am I the only that gets the sense that the DDA and City Council don't talk much? Does the DDA not realize that by putting forth such sloppy (uneducated) proposals w/o doing their homework they only make themselves look bad? Could we please, first, secure proper communication channels and then start looking at possible vetting processes, and then review proposals? As I taught my kids, just because you say the same thing over and over again doesn't mean I will say yes. Tue, Jan 15, 2013 : 1:07 p.m. When will someone drive a stake thru the heart of the hotel-conference center fantasy? There is no data whatsoever, except the anecdotal pipe dreams of a select few, that a conference center could work in downtown. No market study. No survey research. Every city in the country that has a conference center supports it to the tune of hundreds of thousands of dollars a year (Orlando FL and Monterey CA being the exceptions that prove the rule). Once again, the DDA, in the guise of an &quot;open&quot; and unbiased study, hires a consultant, tells him what to do, and comes up with a ridiculous assertion, based on no facts, and ignoring their own surveys and public input that overwhelmingly rejected the idea of short-term public gain over the long-term good of the city when considering the uses for public land. The DDA's bias for gaining tax money from new development, clearly has overwhelmed any incentive it may have as a neutral arbiter of facts. Tue, Jan 15, 2013 : 1:06 p.m.
Ann Arbor should query the many hotels around Briarwood mall re: year-round usage of meeting rooms. Some of these hotels have large multi-purpose rooms (ballrooms) that convert easily to meeting rooms, and are used for small (100-200 people) conferences. If those aren't utilized to the max there's no reason to believe a downtown conference center would be any more successful; maybe less so since room rates would likely be higher. Tue, Jan 15, 2013 : 2:27 p.m. Unfortunately your suggestion makes way too much sensel for those making this type decision to consider it. Sorry. Tue, Jan 15, 2013 : 12:53 p.m.
Has there been a study comparing Ann Arbor and similar cities who built convention centers? Including who paid for what and how they performed over the years? Tue, Jan 15, 2013 : 2:06 p.m.
That would require reporting you silly. Tue, Jan 15, 2013 : 12:52 p.m.
HipHotel OK, Ann Arborites...it's time. It's PAST time. We are a gem of a town and we need a gem of a hotel. Recently stayed at the CityFlats Hotel in Holland, MI and it is amazing. With a gold LEED rating, a contemporary feel, beautifully designed, this hotel would be perfect for our town. It's beautiful, energy-efficient, very comfortable (got the best night's sleep on their own brand mattress), even elegant...and not expensive. The design firm that created this hotel is from Holland, MI and has build another attractive CityFlats Hotel in Grand Rapids. Let's get one in Ann Arbor! Wed, Jan 16, 2013 : 4:26 a.m. Guess I don't get out enough, it is $150+ a night for the dinky room in Holland, I assume that would be more in a2. Is that considered not expensive for a hotel room? Would rather have one up the street from the Embassay than that giant apartment towers they are proposing but not enough to give up potential green space for it. Tue, Jan 15, 2013 : 8:18 p.m.
Good call @Nancy. CityFlats has been circling the Ann Arbor market. Tue, Jan 15, 2013 : 2:36 p.m.
sooze- hate to burst your bubble but Ann Arbor is a small town built around a major university. Thus the 'small town' hotels ringing the city limits. It is not a destination other than those coming to the Univeristy. Tue, Jan 15, 2013 : 2:29 p.m. Sounds like a nice hotel, except for the part about when you wake up, you're in Holland, MI. Tue, Jan 15, 2013 : 2:15 p.m.
... &quot;would be perfect for our town&quot; implies we would all have to live in Holland Michigan. Ann Arborites by definition are not residents of Holland Michigan. I like Disneyland, Sleeping Bear Dunes, Mackinac, Edinburgh Castle, and the Louvre too. So ? Welcome to Ann Arbor. For your temporary accommodation there are plenty of opportunities for Flats off Jackson Road and South State near Briarwood Mall. Public busing there too. Tue, Jan 15, 2013 : 2 p.m.
A small hotel/conference center/cafe and shops area/green area with seating project on the Library Lot with a refurbished library next door, parking underground right there. Why not? Size of Campus Inn max. Downtown has nothing and motels on the outskirts are SO small town! People come from miles around to our restaurants and then have to drive home when they might love to stay here. Do it! If it is such a great idea I'm sure a local developer or national developer will step forward and finance it. The city is ringed with hotels - over built 10 years ago and is just now starting to recover after dozens went through bankruptcy and closed. Tue, Jan 15, 2013 : 12:37 p.m.
&quot;Pollay cited a recent Ann Arbor Area Convention and Visitors Bureau report that indicated Washtenaw County is enjoying its highest hotel occupancy rate in 25 years. In fact, Pollay said, the occupancy rate in Washtenaw County is the highest in the Midwest, including Chicago.&quot; Why is that? Perhaps because we were overbuilt for so long that we are just now catching up, and Oh, by the way, that still only represents about 62% occupancy as evidenced by the CVB's own revenue reports. Who really believes that downtown Ann Arbor is struggling economically now or will ever decline over the next decade? If you do then you should support the DDA's 2-for-1, limited time only, free cake at the grand opening hotel special deal. If you think the city is prospering just fine then the DDA has no basis for continued existence. It should be suspended. Wed, Jan 16, 2013 : 4:46 p.m.
Tue, Jan 15, 2013 : 12:33 p.m. Subsidized conference centers always wind up vacant most of the year and cost their cities a fortune even in big, destination cities. In a small city like Ann Arbor this idea is doubly stupid. Go ahead and offer to sell the properties, or a 99-year lease on them, to hotel developers. I have a feeling nobody will build this convention center unless the city's on the hook when it's a financial disaster. Tue, Jan 15, 2013 : 12:16 p.m. I don't want anything built based on &quot;anecdotal support&quot; from CEO's. I wonder how much Poole was paid for those cherry-picked interviews. Tue, Jan 15, 2013 : 12:49 p.m.
Not unless those anecdotal supporting CEOs are willing to invest. All we'll be doing is building something the University will ultimately buy for pennies on the dollar, take off the tax roles, and use to conduct its own conferences and generate more revenue - i.e. Brandon's Big House. Can you see the NCAA Big Ten meetings here, the coaches conferences here, an extension of the corporate meetings the Big House is currently hosting using the lodging. Are you kidding - Brandon and Mary Sue can't wait for the city to build it, so they don't have to. Tue, Jan 15, 2013 : 11:58 a.m.
Tue, Jan 15, 2013 : 11:33 a.m.
&quot;Council Member Margie Teall, D-4th Ward, said she was in favor of the conference center proposal two years ago and she still thinks it could be &quot;a very exciting development downtown.&quot; She wondered if there's a way it could happen without the city being on the hook financially.&quot; I expected nothing less from Margie Teall who is representing everyone on the planet except the residents of her 4th Ward. Thanks for all your hard work on the Churchill Downs flooding issue and the ugly development on Packard that still stands and which you've taken credit for resolving for several years. Maybe your time could be better spent working for your constituents and not out-of-town developers. Thanks to Council member Kunselman for reminding us about Roxbury Group. Fascinating shady financial ties to the Bob Ficano political machine in Detroit. Wed, Jan 16, 2013 : 12:23 a.m.
Tue, Jan 15, 2013 : 11:29 a.m. Awesome! Good planning with thoughtful urban design. Looks like a good solid plan for development. Now, whiners, you may also join in. Wed, Jan 16, 2013 : 4:45 p.m. I'd vote Halter's comment down a hundred times if I could. Not everyone who's opposed to something is a whiner. There are very good reasons to be against this proposal. Tue, Jan 15, 2013 : 1:51 p.m. The post could've been written by a particular DDA member who will go unnamed. Tue, Jan 15, 2013 : 12:43 p.m.
Tue, Jan 15, 2013 : 11:27 a.m. Anyone else as concerned as I am about losing the very convenient parking at the Kline lot? Sat, Jan 19, 2013 : 3:19 p.m.
@Ryan, so while addressing one thing that makes driving in or too downtown Ann Arbor horrible, your plan is to make things worse further out? Great idea. Tue, Jan 15, 2013 : 3:47 p.m.
Susan Pollay said last night the DDA believes there's space in the current parking system to absorb what's being proposed in the Connecting William Street plan, but the DDA has recommended the Kline Lot be reserved for some future discussion about whether to add a public parking garage similar to the public-private arrangement the city has with developer Village Green on Ann Arbor City Apartments at First and Washington (a parking garage as part of the project that the city is helping to finance, with most of the spaces being public). DDA board member Roger Hewitt said bringing more people to downtown via transit and maybe even building offsite parking facilities outside the downtown (where people who live and work downtown can quickly access their cars but not have to keep them downtown) is another option. Tue, Jan 15, 2013 : 3:22 p.m. I'm not concerned about any particular lot. 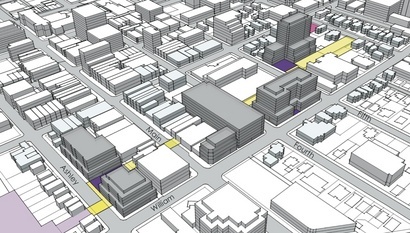 What I am concerned about is creating another reason not to go to downtown Ann Arbor: more business, less parking. Tue, Jan 15, 2013 : 2:04 p.m. I don't often see available spaces there, but I love being able to park there when I can. The fact that it's constantly full testifies to how necessary it is. Please don't build on this lot! Very concerned. The Palio lot is valuable too. Tue, Jan 15, 2013 : 12:31 p.m. Lose the Kline's parking lot? It is always jammed with cars and surrounding parking areas are full also.